It was kinda hysterical to rip through it in 20mins. We spent more time summoning curious friends in than actually dps'ng. Building a rep is of course important. Which should the hunter get the love from first? The first two I'd recommend are the two that you want to have toward the "end-game" of WotLK; The Sons of Hodir and the Knights of the Ebon Blade. They don't have juicy epic gear rewards you'll be interested in. 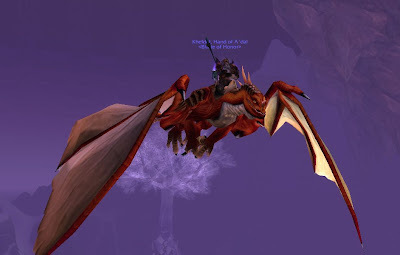 They don't get you a nice big dragon mount. They do get you what you'll really need. For the Sons you want to get to Exalted status. They provide the shoulder enchants you want. Their low-rep shoulder enchant is the same as Aldor/Scryer shoulder enchants. The Sons don't have a tabbard, so you have to get rep with them the BC-fashioned way, daily quests. For Ebon Blade, you'll want to get to Revered status. Luckily, they have plenty of quests, daily quests, and a tabbard! They have some nice weapons, but most importantly, they have your helm enchant. Until you're Revered, you'll be stuck going back to Cenarion Refuge with your new helms. After you have those two reps in your pocket, then you can shoot for another one. I'd pick something based on your crafting pattern needs, or perhaps The Oracles for their trinket. Unless you only have time for dailies and never any heroics, you're likely to fill any gear blind-spots before rep-based gear saves you. Oh joy. I get a few minutes to check on a few things in game, but no. Then again, I really wanted to just get "/played" on Kheldul so I could drop it in a post here. But that'll have to wait. The realm is down for the next few hours. I guess this leaves me open for making some posts and checking some WWStats. I should say off the bat that every guild on our server has been struggling. Not really with the content, but with the various forms of lag and DCs. 1) Too many people, two few 25man servers. We've seen this for a while. It's always fun doing farm runs and having your tanks all DC. Right? This is an old problem that has gotten worse and worse. Do a 10man, you're fine. Do a 25man and some DC even if they didn't have bad latency shown on their client. 2) Wintergrasp and Dalaran are hot spots, combined with a queues-worth of people on the server. This isn't particularly new, and "only" affects BGers for the most part. 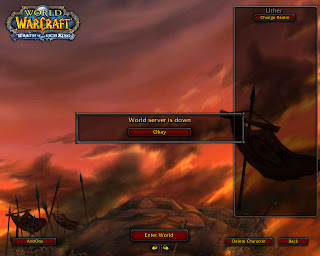 3) Widespread bandwidth shortfall or failures affecting client latency going into Blizzard's colos. I have 3Mbps coming into my house. The traceroute showed a problem a step or two outside Blizz's colo. If traceroute shows an extra 500ms and dropped packets and it's four hops away from my ISP, "resetting my router" is about as useful as re-installing WoW. This seems like a new problem. The concern here is that it was affecting a LARGE and DIVERSE player-base. Hopefully, this new problem is temporary. So, yeah, it's the beginning of the third week of having a 25man with maybe 18 connected at any one time. Anyway, so I can look over a 25man WWS from Tuesday. I'm the top slot hunter. I'd just give the anonymized name, but it seems to change. Thursday, we just barely got a 10man going. But even on Tuesday, we had DCs coming out of everywhere. On Archavon we lost our MT and a bunch of healers the first time. (Almost got him anyway.) The second time I DC'd. Definitely not one of my finer performances. I guess I can blame latency being 2-3x what I normally play with. Loatheb I only got to 4k. I've come close to cracking 5k before. My crit rate was about where it should have been on that fight so I didn't under-dip on spores. I should point out for anyone that hasn't done Loatheb before, that dps should group up in 5packs under a spore and get the buff from its explosion. Based on crit rate, I see our other hunter didn't know that. I'll have to let them know. I suppose this is also as fine a time as any to talk about shot rotation to help any hunters that are looking for a boost. This may be moot when 3.0.8 comes out, since Steady Shot is getting nerf'd on its AP coefficient -- but that patch is taking a long time. Steady-shot (SS) is our meat-and-potatoes shot. For a vegetable side, you'll apply a serpent sting (SrS). You apply the sting because you've taken a glyph of improved steady shot which bumps your SS damage up 10% when you have a sting applied. You probably also have a glyphed serpent sting that increases its dot by 3 seconds. Hunter glyphs FTW. BM hunters should just wail away with SS, mixed in with some SrS refreshes. Toss in Arcane Shot or stutter-stepped Multishot while moving. MM hunters like that as well, but they'll also Chimera Shot (CS). Aimed shot will be more common too. SV hunters also do the SS, but generally they'll trap-dance to proc their Lock and Load, such that they can get their free Lock and Load Explosive (ES) dot-shots off (spaced out of course). So is there a decent macro for the base SS? Yes, there is. There are many like this, but I haven't found any exactly like it. Basically, it makes sure you're auto shotting, and allows you to spam-press for steady shot. If Kill Shot is up and the mob health makes it possible, then it'll do that instead. If Kill Command is available, it'll do that as well. It also gets rid of many of the failure sounds such as "I can't do that yet!" and red error messages. You'll fire your SrS, ES, CS, arcane, and aimed all some other way. But SS is meat-n-potatoes. You could throw Kill Shot and Kill Command in other loaded shot macros. I do. But SS should be the most pressed button so this is where it needs to be. 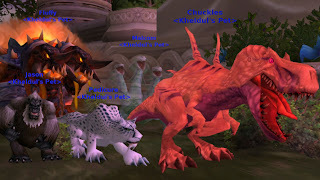 Kheldul has been making his way through Azeroth since November of 2004. I'm an East-coast player, playing on a West-coast server. Back then it didn't matter. All servers were housed in a server farm in CA. Doing the East on West thing meant that I could play a little later and have plenty of people on to do things with. It also meant that I could get on at times that weren't typically crowded if I wanted to. Kheldul has never had a name change or a server change. He's been in a surprisingly small number of guilds. Somehow the guilds always are well-run, mature, and without too much drama. I may start leveling another character to fill in the time between raids and be available for when we have a raid shortage, but Kheldul will always be ready and willing and the thing I think about. I was talented in Marksman for a very long time, until BC. Since then I've been Beastmaster spec'd and thoroughly enjoy it. I got through half of the 1.0 raids (MC, BWL, ZA, AQ20, 3/4 of AQ40), much of 2.0 (but never killed Illidan and only 2/4 in MH and just trash in Sunwell), and now with 3.0, getting enough raiders and surviving MT DCs seems to be the biggest challenge. I've been looking at SV huntering quite a lot lately. I'll most always be talking about PvE. 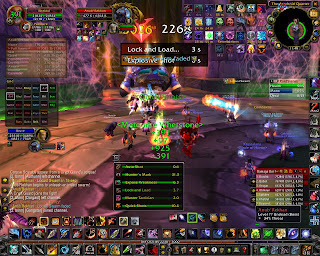 However, I do enjoy PvP BGs quite a bit and it may slip in from time to time. I'm closely watching all the PTR reports and GhostCrawler statements about the incoming hunter changes in 3.0.8. I remember the great pre-BC hunter nerf very well. I'm a numbers guy. I'm an engineer IRL. I like macros and addons. I like being the best and don't like "being-that-guy". I don't play every night. I've never been in a guild or alliance that raided more than three nights a week. I usually don't play on weekends. I'm (/gulp) middle-aged, a husband with a great wife, and a father to some mind-blowingly great kids. I hope you enjoy reading stuff here and find it useful.